Gobble Gobble! It's A Turkey Craftivity! Did you have a nice Halloween?? Mine was so much fun! I live in an older neighborhood where everyone's kids are all grown up so unfortunately there isn't any trick or treating on my street. Sad, I know! That didn't stop us, though! We packed up our kids and went to my buddy's house for some Halloween fun. We also brought him trick-or-treating, of course. He giggled at every house! 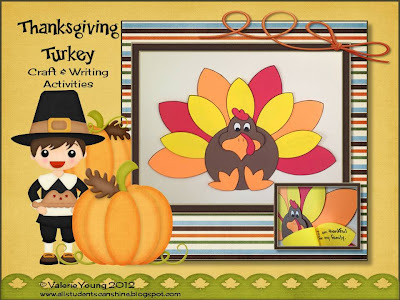 Now that Halloween is over, it's time for me to share my Thanksgiving craft with you! I've been holding out on this but I'm very exited to show it to you now. 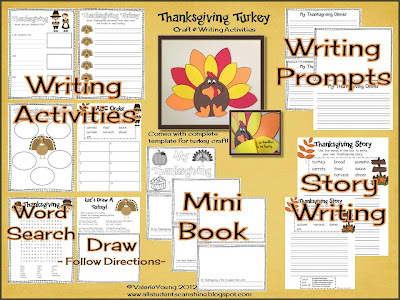 To be honest, this has been posted in my TPT store since September because I made it for my Canadian folks. But today I'm sharing it with my US peeps! Hehehe! As you can see in the picture, the yellow feathers flip open. My students will be writing what they are thankful for inside each yellow feather! Like all my other crafts, I made a bunch of fun activities to go with this one too. If you want this pack, you can get it at my TPT store.